BACKGROUND: Lifestyle significantly impacts the risk factors of prostate cancer, of which diet appears to be the most influential. An emerging chemopreventive approach, which involves the adequate intake of dietary constituents, has shown great potential in preventing the occurrence or progression of cancer. Magnesium is known to be an essential cofactor for more than 300 enzymatic processes, and is responsible for the regulation of various cellular reactions in the body. A plethora of studies have shown evidence that changes in the intracellular levels of magnesium could contribute to cell proliferation, and apoptosis in some normal and malignant cells. 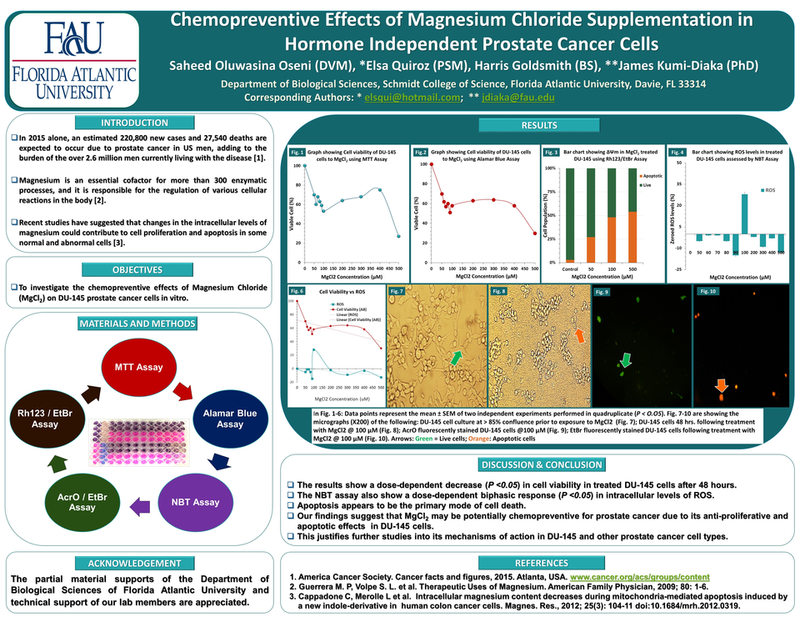 OBJECTIVES: The aim of the study was to investigate the effects of magnesium chloride (MgCl2) in DU-145 prostate cancer cells. METHODOLOGY: Cultured DU-145 cells were subjected to graded concentrations (50-500 µM) of MgCl2 for 48 hours. The cell viability was assessed using MTT and Resazurin reduction assays. NBT assay was also used to assess the treatment-induced intracellular ROS levels. Acridine Orange/Ethidium Bromide (AO/EB) and Rh123/EB fluorescent stains were used to assess the cell death type and mitochondria membrane potential (Δψm) respectively. RESULTS: The results revealed a dose-dependent decrease (P < 0.05) in cell viability in treated DU-145 cells after 48 hours. The NBT assay also revealed a dose dependent biphasic response (P < 0.05) in intracellular levels of ROS. There was a drop (P < 0.05) in ROS levels in all groups except at 100 uM, where ROS level was higher than the control. Apoptosis was the primary mode of cell death as observed in the fluorescence analysis. CONCLUSION: Our finding suggests that MgCl2 may be potentially chemopreventive for prostate cancer. This justifies further studies into its mechanism of action in DU-145 and other prostate cancer cell types.